A pain in the neck is just that: A PAIN IN THE NECK! Unfortunately, this symptom is both common and often difficult to treat. 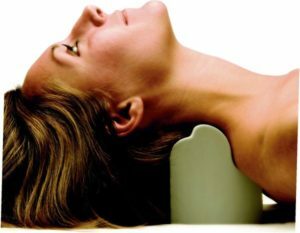 Chiropractors pride themselves of treating neck pain effectively. Yet, the evidence is at best thin, the costs are high and, as often-discussed, the risks might be considerable. Thus, any inexpensive, effective and safe alternative would be welcome. 1) that denneroll cervical traction (a very simple device for the rehabilitation of sagittal cervical alignment) will improve the sagittal alignment of the cervical spine. 2) that restoration of normal cervical sagittal alignment will improve both short and long-term outcomes in cervical myofascial pain syndrome patients. The study included 120 (76 males) patients with chronic myofascial cervical pain syndrome (CMCPS) and defined cervical sagittal posture abnormalities. They were randomly assigned to the control or an intervention group. Both groups received the Integrated neuromuscular inhibition technique (INIT); additionally, the intervention group received the denneroll cervical traction device. Alignment outcomes included two measures of sagittal posture: cervical angle (CV), and shoulder angle (SH). Patient relevant outcome measures included: neck pain intensity (NRS), neck disability (NDI), pressure pain thresholds (PPT), cervical range of motion using the CROM. Measures were assessed at three intervals: baseline, 10 weeks, and 1 year after the 10 week follow up. After 10 weeks of treatment, between group statistical analysis, showed equal improvements for both the intervention and control groups in NRS and NDI. However, at 10 weeks, there were significant differences between groups favouring the intervention group for PPT and all measures of CROM. Additionally, at 10 weeks the sagittal alignment variables showed significant differences favouring the intervention group for CV and SH indicating improved CSA. Importantly, at the 1-year follow-up, between group analysis identified a regression back to baseline values for the control group for the non-significant group differences (NRS and NDI) at the 10-week mark. Thus, all variables were significantly different between groups favouring the intervention group at 1-year follow up. The authors concluded that the addition of the denneroll cervical orthotic to a multimodal program positively affected CMCPS outcomes at long term follow up. We speculate the improved sagittal cervical posture alignment outcomes contributed to our findings. Yes, I know, this study is far from rigorous or conclusive. And the evidence for traction is largely negative. But the device has one huge advantage over chiropractic: it cannot cause much harm. The harm to the wallet is less than that of endless sessions chiropractors or other manual therapists (conceivably, a self-made cushion will have similar effects without any expense); and the chances that patients suffer a stroke are close to zero. On this blog, I have repeatedly discussed chiropractic research that, on closer examination, turns out to be some deplorable caricature of science. Today, I have another example of what I would call pseudo-research. This RCT compared short-term treatment (12 weeks) versus long-term management (36 weeks) of back and neck related disability in older adults using spinal manipulative therapy (SMT) combined with supervised rehabilitative exercises (SRE). Eligible participants were aged 65 and older with back and neck disability for more than 12 weeks. Co-primary outcomes were changes in Oswestry and Neck Disability Index after 36 weeks. An intention to treat approach used linear mixed-model analysis to detect between group differences. Secondary analyses included other self-reported outcomes, adverse events and objective functional measures. A total of 182 participants were randomized. The short-term and long-term groups demonstrated significant improvements in back and neck disability after 36 weeks, with no difference between groups. The long-term management group experienced greater improvement in neck pain at week 36, self-efficacy at week 36 and 52, functional ability and balance. The authors concluded that for older adults with chronic back and neck disability, extending management with SMT and SRE from 12 to 36 weeks did not result in any additional important reduction in disability. What renders this paper particularly fascinating is the fact that its authors include some of the foremost researchers in (and most prominent proponents of) chiropractic today. I therefore find it interesting to critically consider the hypothesis on which this seemingly rigorous study is based. 36 weeks of chiropractic therapy plus exercise leads to better results than 12 weeks of the same treatment. I find this a most remarkable hypothesis. 36 weeks of therapy with the new drug plus exercise leads to better results than 12 weeks of the same treatment. Now let’s assume the authors affiliated with the drug manufacturer concluded from their findings that for patients with chronic back and neck disability, extending drug therapy plus exercise from 12 to 36 weeks did not result in any additional important reduction in disability. WHAT DO YOU THINK SUCH A TRIAL CAN TELL US? My answer is ‘next to nothing’. SMT might not be the solution to neck and back related disability. Harmful effects of chiropractic on functioning and well-being of neck- and back-pain patients? This study was aimed at evaluating group-level and individual-level change in health-related quality of life among persons with chronic low back pain or neck pain receiving chiropractic care in the United States. A 3-month longitudinal study was conducted of 2,024 patients with chronic low back pain or neck pain receiving care from 125 chiropractic clinics at 6 locations throughout the US. Ninety-one percent of the sample completed the baseline and 3-month follow-up survey (n = 1,835). Average age was 49, 74% females, and most of the sample had a college degree, were non-Hispanic White, worked full-time, and had an annual income of $60,000 or more. Group-level and individual-level changes on the Patient-Reported Outcomes Measurement Information System (PROMIS) v2.0 profile measure were evaluated: 6 multi-item scales (physical functioning, pain, fatigue, sleep disturbance, social health, emotional distress) and physical and mental health summary scores. Within group t-tests indicated significant group-level change for all scores except for emotional distress, and these changes represented small improvements in health. From 13% (physical functioning) to 30% (PROMIS-29 Mental Health Summary Score) got better from baseline to 3 months later. The authors concluded that chiropractic care was associated with significant group-level improvement in health-related quality of life over time, especially in pain. But only a minority of the individuals in the sample got significantly better (“responders”). This study suggests some benefits of chiropractic on functioning and well-being of patients with low back pain or neck pain. These conclusions are worded carefully to avoid any statement of cause and effect. But I nevertheless feel that the authors strongly imply that chiropractic caused the observed outcomes. This is perhaps most obvious when they state that this study suggests some benefits of chiropractic on functioning and well-being of patients with low back pain or neck pain. To me, it is obvious that this is wrong. The data are just as consistent with the opposite conclusion. There was no control group. It is therefore conceivable that the patients would have improved more and/or faster, if they had never consulted a chiropractor. The devil’s advocate therefore concludes this: the results of this study suggest that chiropractic has significant detrimental effects on functioning and well-being of patients with low back pain or neck pain. Try to prove me wrong! I am concerned that a leading journal (Spine) publishes such rubbish. It is no secret to regular readers of this blog that chiropractic’s effectiveness is unproven for every condition it is currently being promoted for – perhaps with two exceptions: neck pain and back pain. Here we have some encouraging data, but also lots of negative evidence. A new US study falls into the latter category; I am sure chiropractors will not like it, but it does deserve a mention. This study evaluated the comparative effectiveness of usual care with or without chiropractic care for patients with chronic recurrent musculoskeletal back and neck pain. It was designed as a prospective cohort study using propensity score-matched controls. Using retrospective electronic health record data, the researchers developed a propensity score model predicting likelihood of chiropractic referral. Eligible patients with back or neck pain were then contacted upon referral for chiropractic care and enrolled in a prospective study. For each referred patient, two propensity score-matched non-referred patients were contacted and enrolled. We followed the participants prospectively for 6 months. The main outcomes included pain severity, interference, and symptom bothersomeness. Secondary outcomes included expenditures for pain-related health care. Both groups’ (N = 70 referred, 139 non-referred) pain scores improved significantly over the first 3 months, with less change between months 3 and 6. No significant between-group difference was observed. After controlling for variances in baseline costs, total costs during the 6-month post-enrollment follow-up were significantly higher on average in the non-referred versus referred group. Adjusting for differences in age, gender, and Charlson comorbidity index attenuated this finding, which was no longer statistically significant (p = .072). The authors concluded by stating this: we found no statistically significant difference between the two groups in either patient-reported or economic outcomes. As clinical outcomes were similar, and the provision of chiropractic care did not increase costs, making chiropractic services available provided an additional viable option for patients who prefer this type of care, at no additional expense. This comes from some of the most-renowned experts in back pain research, and it is certainly an elaborate piece of investigation. Yet, I find the conclusions unreasonable. Essentially, the authors found that chiropractic has no clinical or economical advantage over other approaches currently used for neck and back pain. So, they say that it a ‘viable option’. I find this odd and cannot quite follow the logic. In my view, it lacks critical thinking and an attempt to produce progress. If it is true that all treatments were similarly (in)effective – which I can well believe – we still should identify those that have the least potential for harm. That could be exercise, massage therapy or some other modality – but I don’t think it would be chiropractic care. Comparative Effectiveness of Usual Care With or Without Chiropractic Care in Patients with Recurrent Musculoskeletal Back and Neck Pain. Elder C, DeBar L, Ritenbaugh C, Dickerson J, Vollmer WM, Deyo RA, Johnson ES, Haas M.
chiropractors are in denial of these problems. Considering the seriousness of these issues, it is important to do more rigorous research. Therefore, any new paper published on this subject is welcome. A recent article might shed new light on the topic. The objective of this systematic review was to identify characteristics of 1) patients, 2) practitioners, 3) treatment process and 4) adverse events (AE) occurring after cervical spinal manipulation (CSM) or cervical mobilization. A systematic searches were performed in 6 electronic databases up to December 2014. Of the initial 1043 articles thus located, 144 were included, containing 227 cases. 117 cases described male patients with a mean age of 45 and a mean age of 39 for females. Most patients were treated by chiropractors (66%). Manipulation was reported in 95% of the cases, and neck pain was the most frequent indication for the treatment. Cervical arterial dissection (CAD) was reported in 57% of the cases and 45.8% had immediate onset symptoms. The overall distribution of gender for CAD was 55% for female. Patient characteristics were described poorly. No clear patient profile, related to the risk of AE after CSM, could be extracted, except that women seemed more at risk for CAD. The authors of this review concluded that there seems to be under-reporting of cases. Further research should focus on a more uniform and complete registration of AE using standardized terminology. This article provides little new information; but it does confirm what I have been saying since many years: NECK MANIPULATIONS ARE ASSOCIATED WITH SERIOUS RISKS AND SHOULD THEREFORE BE AVOIDED.